Follow us on our journey to transform our Green Bungalow into a home! Earlier this month I had the amazing opportunity to attend a design event at the Museum of Science in Boston. It was a fantastic evening where I heard Lincoln MKC designer Peter Jones and Zakim Bridge designer Miguel Rosales discuss beauty in design. 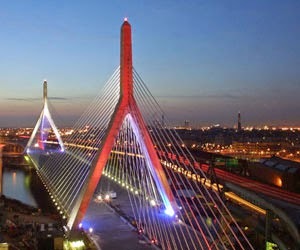 The event had a gorgeous view of the Zakim as its backdrop. It really was stunning. 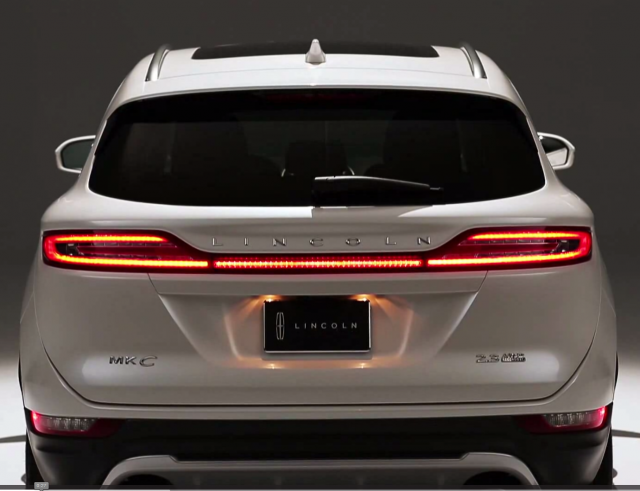 Equally stunning was the new Lincoln MKC they had on display. This is not your grandfather's Lincoln! The car is really gorgeous - it has a super stylish shape that not-so-subtly hints at speed. I would have loved to take it for a spin. We did get to sit inside for a few minutes and the perforated leather seats (which heat AND cool) were like butter! I was surprised to learn the car has push button shift - what?! - And at night the car lights up as you approach it. Apparently the future is here. I had to pull myself away from the car to attend the actual event! I learned from the designers that both the automotive and architecture industries are using LED lighting to create high impact with the smallest footprint. Energy savings is crucial these days, and the fact that these lights last longer and tend to look better than tradition lights is also a huge selling point. Clearly LED lighting is everywhere these days! And it seems many are making the switch inside their homes as well. With summer right around the corner (I hope!) I've been giving a lot of thought to sprucing up our modest outdoor space. Inspired by this design discussion, I've been exploring environmentally-friendly lighting solutions that will cost less in the long-run, but still fit with my vision of a comfortable outdoor retreat. I recently came across this simple DIY LED tea light project on Apartment Therapy that could be a fun way to bring light and a little personalization to an outdoor space. Not only can you switch up the graphic on the paper wrap, but you could even play with mood lighting by trying different colored lights. This could be the perfect addition to a tablescape at an outdoor dinner party. Perhaps they'd go nicely with this table with built in cooler I've been dying to put together! First time homeowners transforming our Green Bungalow into a home through crafty DIY and other projects. I'm an avid traveler who enjoys photography, the outdoors, wine & pretty things.